VIDEO: Despite The Risks, Morphine Can Offer Hope : Goats and Soda Morphine, like other opiates, is controversial. It poses risks. But for some patients, like a man in India who's profiled in a short documentary, the painkiller offers hope. Zubair, who was diagnosed with a bone tumor and had part of his leg amputated, uses morphine to manage his pain. "Because of morphine I am surviving," he says. With the pain relief, he can ride his motorbike and work at a coffee shop. Morphine. It's why Zubair in Kerala, India, can ride his motorcycle, work at his coffee shop and bring an income home to his family. Without his daily dose, living a normal life is nearly impossible. "The pain is like someone stabbing you with a needle on your body and joints," he says of his life after being diagnosed with a bone tumor in 1979. Since then, he's had to have a series of progressive amputations below his right knee. 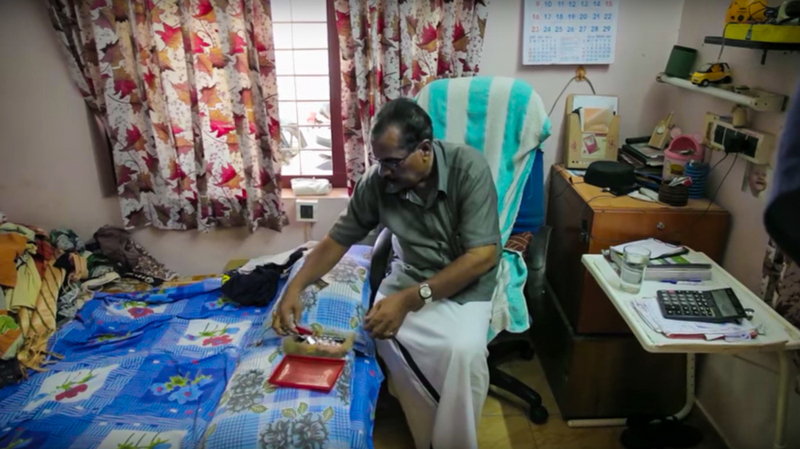 Zubair is the subject of a 2-minute film on access to morphine in India by Atish Patel. It will be shown on Saturday at a global health film festival organized by the Pulitzer Center for Crisis Reporting at the Consortium of Universities for Global Health conference in Washington, D.C.
Patel, a Pulitzer Center grantee, wanted to show people that palliative care — providing relief for pain from severe conditions — is not just for terminal patients. "Before I took this reporting trip, I thought opioids were only given to people dying of an illness, unable to be cured," he says. "But what was nice about Zubair's story, he's still active." Fewer than 1 percent of India's 1 million cancer patients, and other patients with disabling diseases, have access to painkillers in the form of opioids, according to a study. But Zubair lives in Kerala, home to the country's leading palliative care program. A lack of access to morphine seems to be a common story in the developing world, says Dr. Sydney Dy, a palliative care physician and researcher at Johns Hopkins University. "Morphine, in its most basic form, is cheap. So there are no incentives for drug companies to distribute in these countries," she says. "And there are a lot of fears about addiction. Physicians aren't trained on how to use [opioids], how to give them." Over the past few years, Indian health officials have started to recognize that Zubair is not alone in his pain. In 2014, the government passed a law to make it easier for patients to receive palliative care by lifting license requirements for hospitals and pharmacies to administer opioids. Even if morphine does become more widely available, there are few studies that show it's a sustainable, long-term treatment for patients like Zubair, says Dy. "People become dependent on opioids without necessarily realizing it." But despite the risk of dependency, she says, "To give [patients] something basic that can relieve their suffering and make their families feel comfortable again, it's amazing."